Rent The Rotunda Banquet Facility | Corporate Events | Wedding Locations, Event Spaces and Party Venues. The Rotunda banquet hall, located in Waukesha, has now been restored to its original grandeur, taking its well-deserved place as one of the premier event facilities in southeastern Wisconsin. Rich in history, amenities and luxury. The Rotunda can accommodate up to 250 guests in classic style. Every Bride & Groom deserves a full service experience. That begins with a picturesque venue. 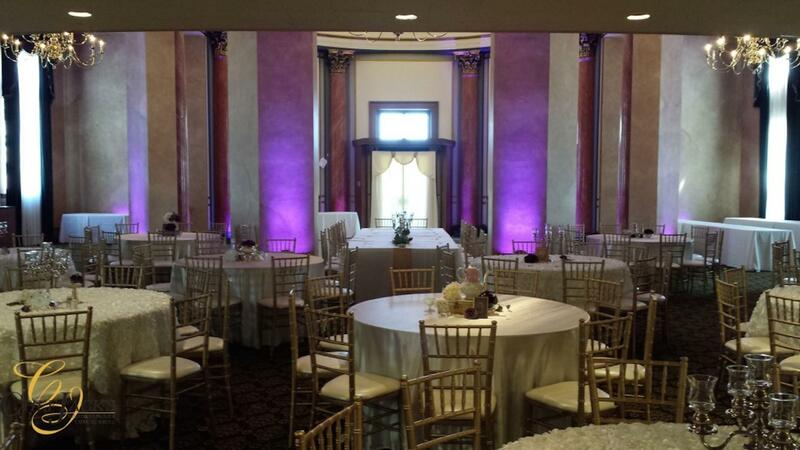 The Rotunda provides a charming and iconic setting for wedding ceremonies and receptions. With the uniqueness of the facility, impressive menu options, and helpful staff, The Rotunda provides a wonderful experience for you and your guests.Photographs are one of the most important keepsakes from your wedding. Complimenting the gorgeous ambiance of the newly renovated dining room and mezzanine, we also offer a beautiful landscaped setting outdoors. Our grand veranda presents a charming and unique backdrop for bridal party, family, and group photos, as well as cocktails and mingling for your guests after the ceremony. The Rotunda is an exclusive Chef Jack’s Catering property. We will provide all food, beverage, linen, and coordination for your event.From elegant sit-down dinners to fun and exciting station buffets, Chef Jack’s Catering has a wide variety of styles and options to customize your menu. Specializing in “the art of hospitality”, your event is as important to us as it is to you. From our very first meeting to the day of the event, we will go above and beyond to ensure that your occasion is as spectacular and stress-free as possible. The Rotunda, hewn from Bedford Limestone, stands as an outstanding example of Classic Revival architecture with 20th century Neo-Classicism refinements. Six fluted Doric columns tower nearly 2-stories above the expansive curved portico. A shallow coffered dome, meticulously tooled with copper, is a brilliant testament to the time-honored traditions of quality and craftsmanship. The exterior is masterfully balanced with ornamentation continuing through the vestibule and beyond. The Rotunda boasts a 35-foot lobby, rich with refined elegance. The colonnade of stately two-story red marble columns are crowned with classically detailed gold capitals. By day, sunlight cascades through a beautiful stained glass skylight and onto the circular coffered dome.